Developed by Shining Rock Software. Published by Shining Rock Software. Released February 18 2014. Available on PC. Oh crap, that sheep pasture has an infestation again. 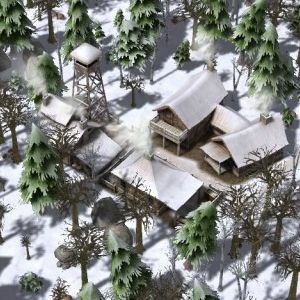 In Banished, a barebones town simulator from the mind of Luke Hodorowicz at Shining Rock Software, you guide the meager existence of a small group of settlers in a frontier setting. You build houses and roads, barns and markets, tailors and blacksmiths, chapels and graveyards - all to balance resources, health and happiness so your townsfolk can survive the rough winters and maybe even get it on with each other to create more workers for you. To really be successful, you need to trade with random merchants who come by way of the river that snakes through each area to get more seeds and livestock like cattle or sheep, but you can't depend on anyone outside your town to keep your people alive. 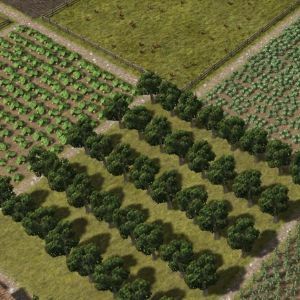 Banished is a neat little simulation, but it doesn't take long to see all it offers, and even though there's a great interface, the game could benefit from more of a, well, soul. The title is probably the most evocative aspect of the whole game. The settlers you start each procedurally generated area with have been pushed out of their home towns and must start building anew with very little resources. The "game" is to create a large, efficient community from a few dozen people, a hundred logs and some seeds. You don't control the individual movements of the townsfolk - you assign jobs you want done like clearing away trees in an area or constructing a building. It's very simple and easy to play, and the tutorials and in-game wiki clearly explain the game's mechanics. Time can move forward at various speeds, but in practice you'll be running the simulation as fast as you can or pausing it to give out orders or deal with a disaster. There were moments I wish I could make the simulation go even faster, but the "pause-able real time" mode of play works well. Banished really does make you think about the needs of a human animal in the wilderness. Food is the first priority, and you can build various structures to collect it early on, such as a hunter's lodge - providing venison and a small amount of leather - or a gatherer's hut for berries, onions and other root vegetables. Once you build a fisherman's dock, say, it's a simple matter to assign workers to fish there and they will begin collecting resources for you. Having a few places gathering food should give you enough to feed your town for a while. But then when the first winter hits, the townsfolk will need firewood and clothing or they will freeze to death. For the former, you need a woodcutter to make firewood from logs, which are generated from clearing trees in the wilderness. For the latter, you need to build a tailor, who will take the leather to make jackets, which is pretty good at keeping people warm - and stylish to boot. Of course, if wool was available, you could provide even warmer clothing. That's the general progression of the game. 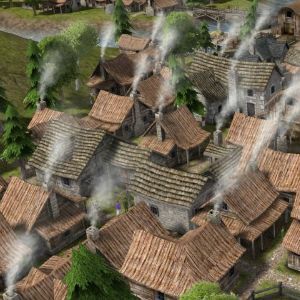 Setting your town up so you have the right combination of resources to provide the best possible way to address your town's needs is extremely satisfying, bordering on addictive. Of course, if you don't address their needs, the people in your town will very quickly die. Freezing to death is a real possibility, as is starvation. In fact, throughout the course of a hundred years of the simulation, you will witness countless deaths in your town. Most die from old age, but miners or stonecutters in your quarries have a higher chance of death on the job. I'm glad Banished didn't shy away from the effect death can have. Building a cemetery is a weird thing you must consider carefully - you can't remove graves so the real estate is gone forever, but having a place for your townsfolk to mourn their dead can actually improve their happiness. You can also have a brewer make wheat beer for the same effect, which I appreciated immensely. While death is always present, there's nothing very hard about the game. Given enough time and half a brain, it's going to be pretty easy to succeed in building your town to a population of 500 or more adults. There are setbacks thrown at you like a tornado ripping through or an outbreak of cholera, but these "disasters" aren't really all that terrible. Rebuild some houses, get a doctor, and the town recovers surprisingly well. You can tweak the difficulty settings to provide less starting resources, or a more rugged area, which does provide some challenge. Still, after a certain amount of time, Banished becomes a slog with no proper end game goal to motivate players to stick around beyond a few Steam achievements. It's only fun up to a point. The interface is something special in Banished. You can have as much or as little information up on the screen as you would like. You can have a status window displayed with your town's stats, a message list showing the latest events like deaths, births, graphs of census information after you've built a town hall or none of that stuff and just look at your town. I made great use of a window showing the current jobs of your population and making tweaks as needs changed and surfaced. Clicking on a building brings its stats, and you can pin that window so it's always displayed or leave it to be closed once you click on something else. The UI is efficient and well-designed, and I wish more strategy games provided this level of control over information. While there is a certain beauty to the clean interface and appearance of your town, the lack of an art style just looks really boring after a while. The buildings aren't pretty - the architecture clearly choosing function over form. If you zoom in the view to peruse the individual people whisking about their daily routines there's some quirkiness - say, that lady has a red skirt! - but really Banished is very bland. A tavern should have more style to it than a blocky building with no sign, and after you've built the same exact model of stone house a thousand times it starts to get dull. Banished is one of those games that would benefit from a vibrant modder community to give it some soul. There's also no excuse for the number of times the game crashed on me. The client would have a fatal error and freeze up every three or four hours of play. Once I set the game to autosave every five minutes, the crashes became more of a nuisance than anything truly frustrating but that many crashes is unacceptable. The simulation runs fairly well on decent PCs, but a large town on the highest speeds starts to decrease the frame rate substantially. There's obviously no fancy graphics clogging up the CPU so what's the problem? I hope the developer is able to clean up the bugs and streamline the code for the release. Bottom Line: Life on the frontier wasn't pretty and neither is Banished, but it does provide an interesting city-building simulation with an excellently designed user interface. Recommendation: Worth picking up if you like balancing resources for ten or twenty hours of fun, but don't expect Banished to change your life.